In this new 4 series blog, we help you understand more about diabetes types, with a strong focus on type 2. We’ve seen type 2 diabetes disappear in some of our clients, and unfortunately many don’t realise that type 2 diabetes can be reversed. Join us as we cover the most important information, and we’ve included bonus material to help you get back on track.Today we look at type 2 diabetes and changing habits. We all know how saturated the diet market really is. Trying to find the right information online can be tedious, and you end up where you started, not knowing the answers you were looking for in the first place. 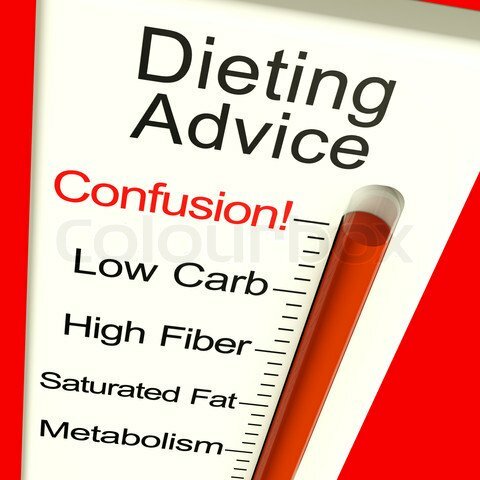 Dieting, exercise, healthy eating, organic foods, raw foods, low carbs, high carbs, good fat and bad fat, over and over we hear and see it all. So where does this leave you? Where does this leave the people who honestly want a healthy lifestyle change? 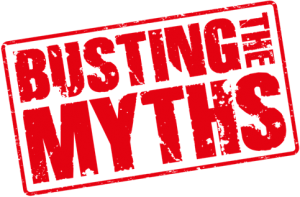 In part III of our Type 2 diabetes series, we are going to bust a lot of myths, and show you real evidence to support our claims. In many ways, and as we’ve stated in the previous blogs, you are being lied too. Type 2 diabetes can be reversed, and you can start your journey to a healthy lifestyle today. This myth has caused considerable heartache. It’s not easy having type 2 diabetes or type 1 for that matter. But many assume based on mixed facts and no straight answers that all sugar is off limits. Many diabetics then think life can’t get any worse, and often times become depressed. Busted: Okay, it’s true that a lot of sugar isn’t good for ANYONE or any diet. If you have diabetes however, it doesn’t mean that sugar and sweets are entirely off limits. Look at it this way, when it comes to carbohydrates including complex carbs, all sugars are broken down into glucose during digestion. The glucose is then used for energy in your cells. It doesn’t matter which carbohydrate either, all forms of carbs break down into glucose, thereby increasing blood glucose levels. If you’re a type 2 diabetic, you can enjoy a sweet once a while, but you need to monitor your total carb intake and make sure you are within safe levels. Keep in mind, though, that when it comes to simple sugars, moderation is key for everyone — not just people with diabetes. White flour, white sugar and white bread is usually what pops into peoples mind when they think of “white foods”. But don’t forget other white foods like potatoes, cauliflower or onions – do you think these white foods are bad for you? Of course not, and they should be part of any good diet. Of course some white foods can significantly increase glucose levels, mainly because they are highly processed. High processes foods usually include enriched flour and white sugar. Busted: Too often, white potatoes get a bad rap, and so does rice. Although it’s true that sweet potatoes are digested more slowly, and can increase glucose it doesn’t mean you can’t eat them. Moderation is the thing, and not over doing it and using basic common sense means you get to enjoy more. This is the most common myth among most when it comes to being diagnosed with type 2 diabetes. If there is one thing we got taught in school it was to balance. A balanced diet that includes good fats and carbohydrates promotes a healthy lifestyle it certainly doesn’t discourage it. If you’ve recently been diagnosed with type 2 diabetes, there’s no doubt you are feeling overwhelmed with information, and unfortunately most people are telling you that you need to cut carbs and sugar completely out. But the awesome news is you can still eat carbs, and most importantly, not all fats are bad for you. Managing diabetes is about keeping your glucose levels within a healthy range. If your sugar is to high you risk really damaging your body, so again, not overdoing it and making common sense choices will help. Busted: A balanced meal is the key – let’s not even call it a diet! In fact, no one should be dieting, everyone should just be eating healthier. Instead of avoiding all carbs, just focus on choosing the healthiest types. Don’t forget to space out your carb intake throughout the day and balancing your plate with carbs, lean protein and healthy fat at each meal. This is by far the most annoying of all the myths surrounding healthy choices, dieting and type 2 diabetes. Sugar free doesn’t mean carbohydrate free and many foods will be marketed as sugar free without telling you the whole truth. For example, bread based sugar free foods like sugar free desserts are very rich in carbohydrates. Busted: It is so important that you read the labels on all foods but especially the proclaimed “sugar free” foods. This is where so many people get confused, and it’s not your fault. The marketing campaigns behind some of these are plain dis-honest, and its best you keep that in mind. Here’s a good tip to keep in mind when reading that label – look at the total grams of carbohydrates, not just the grams of sugar as we often do. This by far is the most important section of our top 5 myths – far too many people diagnosed with type 2 diabetes find themselves in major denial, and frankly, they just don’t want to listen. They make life threatening assumptions, and turn off the common sense button in their head because they refuse to make the right choices. Well, here’s the bottom line, if you don’t make better choices you risk serious illness, possible blindness, amputation, or worse, death. Busted: No, taking insulin means you MUST make better choices – but if you’re type 2 and have been given insulin this means things are VERY BAD. If you’re thinking, ‘hey, I can eat 2 Big Mac meals and get a chocolate Sundae, as long as I give myself a couple of extra units of insulin,’ you are doing it all wrong. If you’ve recently been diagnosed with type 2 diabetes, most likely your doctor is sending you back to school – diabetic school that is…but in the shape of a dietician. In some cases you will see a diabetic nurse and in more serious cases, you might be sent to a specialist. No matter who you might see, remember to pay close attention, and take some notes. But here’s where we throw you a bit off track…once you learn from your designated educators, start doing some more serious research. 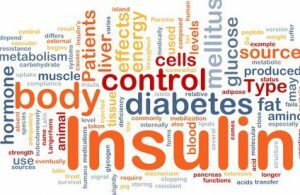 Ask yourself a serious question – who really profits from type 2 diabetes? You’ve likely been given red or orange folders from the doctors, dieticians or nurses. On those folders usually placed in the top left hand corner is the sigma or company logo of a pharmaceutical company. Some sort of “branding” is what you will see. In these folders you will find information that help’s you in many ways, but the shocking truth is most of the information in that folder is keeping you sick. We go through this more in our final blog series – part IV. This is not the time to get discouraged, and as we’ve stated before, we understand how tough this can really be. But, being diagnosed with type 2 diabetes is not all doom and gloom. Be thankful it was caught in time or things could have been much worse. You are being given a unique opportunity to really turn things around, get healthier, and best of all get happier! Learning the skills necessary is the first step, and although it may take some getting used to, the more you learn about diabetes, and its complications the more control you can take back. What about managing your blood sugar? Your diabetes educator will show you how to check your blood sugar, and provide you with a free monitor to get started. Then it’s your turn to start checking your blood sugar level and writing down the results. Get yourself a little notebook to keep track, and this helps tell you how well you are managing your diabetes. 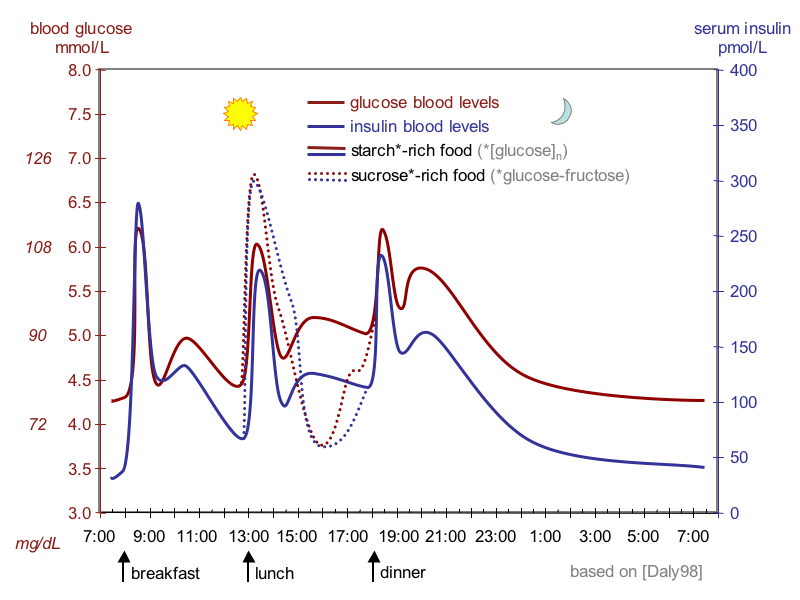 Wikipedia.org: The fluctuation of blood sugar (red) and the sugar-lowering hormone insulin (blue) in humans during the course of a day with three meals. Okay, so by now you’re tired of hearing about glucose levels, blood tests, dieting, and cauliflower as a way to manage your type 2 diabetes and get healthy. So, let’s take a look at some other not-so-common areas where you can help control your type 2 diabetes. 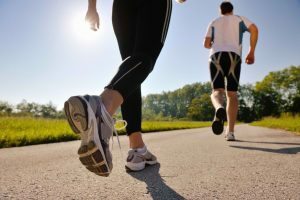 As you trawl throughout thousands of websites dedicated to type 2 diabetes, you are unfortunately bombarded by fast tips and tricks when it comes to exercising. But we’re going to give it to you straight – NO, sorry but parking your car a bit farther away or taking the stairs instead of the elevator isn’t going to cut it. Most of these exercising tips are a bunch of hooey and fluff, and these websites are only trying to keep up with the ‘blog race’. This means they look for trending topics to write about so they can compete with similar sites to them to be found first in Google. So when it comes to ‘other’ little known lifestyle changes, we’re starting with REAL exercising. Study after study shows us that if you just start exercising, you will need at the very least one full hour of a tough workout every single day to noticeably lose weight. During this tough regiment of exercise, you shouldn’t be drinking sports drinks high in sugar, so once again please ignore those ridiculous marketing campaigns and commercials. Exercise alone isn’t enough either, you must eat good foods, low in carbs, and rich in fats and protein. Don’t be thrown off by what we are saying here, and certainly lose your “brainwashed” fear of FAT immediately – it may save your life! 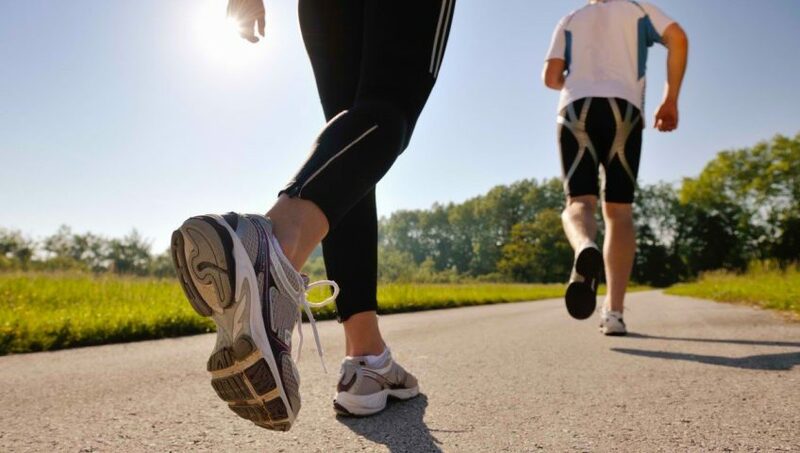 You’ve just been diagnosed with type 2 diabetes so getting on track with good exercise is going to take some time and dedication – most importantly you need the right advice. First, you must take care of other things, and get the go ahead from your doctor. In some cases, many recently diagnosed people will need a lot of pills to begin management, so exercising right now might not be a good idea. You need to fist take care of some things in order to make sure you’re ready for exercise. You can read the Diet Doctor’s The 18 best weight loss tips to help you grasp some steps. In our free download, we put together some more interesting facts in relation to exercising and eating better. We introduce you to LCHF, the low carb, high fat diet. We want to stray away a bit from the word “diet”, because in all realty you shouldn’t be going on a diet, a diet refers to a short duration to reach a goal; whereas a change in lifestyle means for the rest of your life. Remember, the only goal here is to reverse type 2 diabetes, and get your life back. You will find the download in our conclusion at the end of this blog. The next on our ‘not so common’ tips is stressing less and sleeping more – this can help you maintain better control over diabetes. So, there is a lot to take in, and there is certainly a lot to learn. In this download, we help you get on track by offering you a blend of information that may actually surprise you. Even better, you’ll be happy to learn that you can change your lifestyle by eating delicious foods without calorie counting. In our final series, part IV of type 2 diabetes, you’ll finally learn the truth about full reversal.